I love Mexican Food. Not Tex-Mex. Not the Taco Bell kind. But the authentic stuff that has its roots in Mayan, Aztec, and Spanish culture. 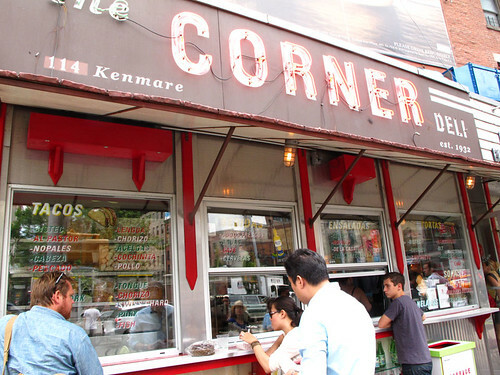 Finding true-blooded Mexican fare in New York City can occasionally be a daunting task. 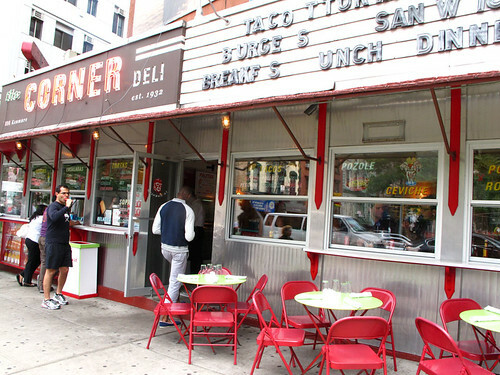 But here's a down-to-earth joint in the thick of Manhattan's shopping and dining jungle - Soho - that's a reliable standby. Folks, they're not reinventing the wheel here. 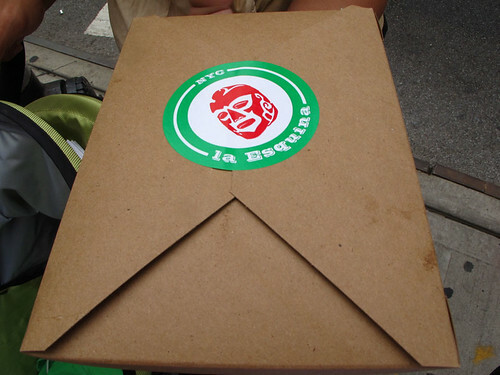 They just serve gratifying Mexican food at La Esquina. Despite being in the land of gentrified Soho, it does not take away the rough-edged, slightly dingy persona of a taqueria, although the same can't be said for La Esquina's more polished brasserie and café annexes. 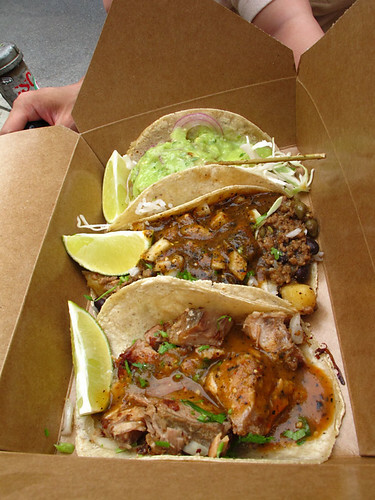 Tacos are the most widely ordered items on the menu, and with good reason - they're simply delicious! Bistec (steak), al Pastor (roast pork), nopales (cactus), pescado (fish), pollo (chicken), picadillo (beef) chorizo (well, chorizo sausage), lengua (tongue), acelgas (swiss chard), and cochinita (pork) are some of the choice fillings. 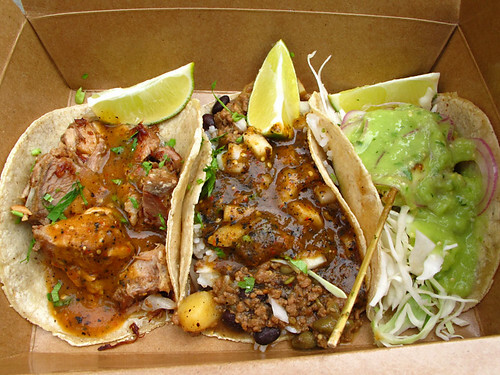 And they all come with their respective frills: onions, cilantro, avocado, pico de gallo, salsa verde, and chipotle salsa. The requisite stance? Feet shoulder-width apart in attack mode; head thrust forward to catch the dribbles of sauce that may fall; and finally, a nod coupled with an eye roll in agreement and delight. This is one hell of a taqueria! Believe it or not, there's a brasserie downstairs (accessed from a door marked "Employees Only") and a café around the corner. Be forewarned, though. 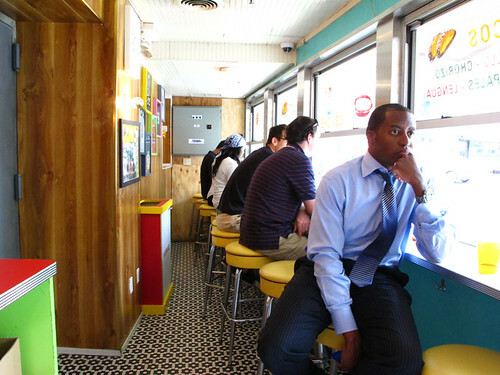 There is always a line-up at any time of the day (or night). Everything is prepared fresh, so by the time we got there - which was 3:00 pm on a Friday - some of the items we initially wanted to order were all gone. Hence, we had (from the top of the photo) grilled fish with shredded cabbage and salsa verde; beef guisado, rice, black beans, salsa molcajete, and pork, onions, cilantro with salsa macha. My vote goes to the roast pork taco! 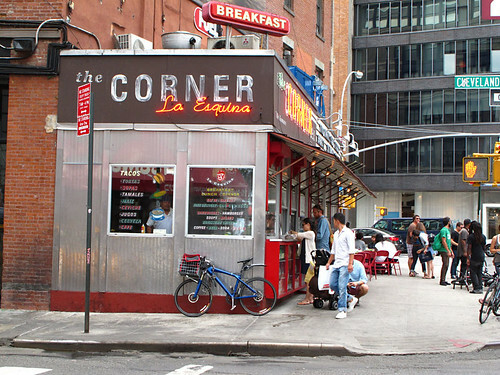 You can't get any closer to the real deal than at La Esquina!